Manchester United made it six Premier League wins out of six since Ole Gunnar Solskjaer took charge, with a home win over Brighton that ended up being harder work than it might have been. 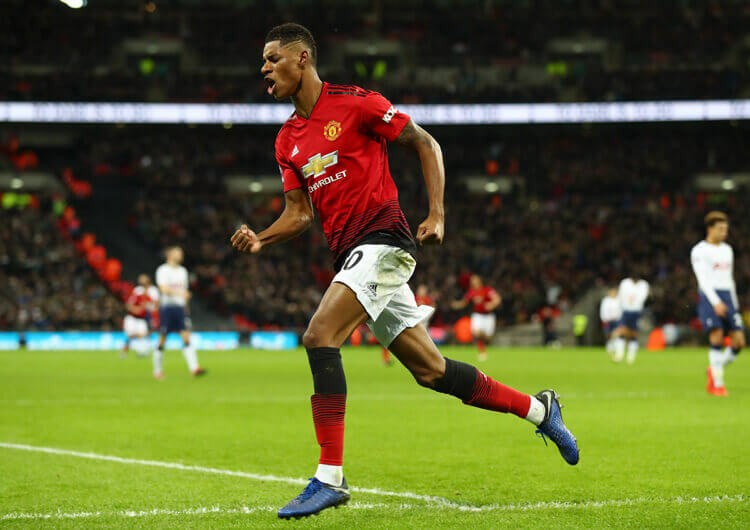 The points looked safe at half-time, with a Paul Pogba penalty and a Marcus Rashford strike – his fifth goal in six since the new head coach arrived – securing the hosts a two-goal cushion. Brighton improved after the break, and pulled one back through Pascal Gross 20 minutes from time – but the visitors were unable to find an equaliser, with United moving to within just three points of Chelsea in fourth place. 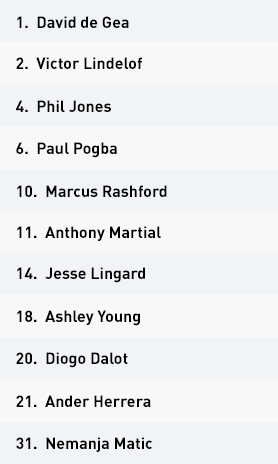 Ole Gunnar Solskjaer set Manchester United up in a 4-3-3 attacking structure, with Jesse Lingard and Anthony Martial starting either side of Marcus Rashford in a front three. 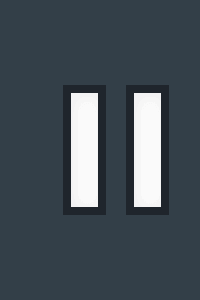 Both wide players looked to move inside to create room out wide for full-backs Ashley Young and Diogo Dalot to advance, although this happened more with Lingard and Young on the right. Ander Herrera and Nemanja Matic began as a double pivot, with Herrera’s runs in behind Brighton’s midfield block giving Victor Lindelof the option to step forward from centre-back. It was often Herrera’s marker – mostly Davy Propper – who pressed Lindelof, which then gave the home side the perfect line through the visiting block. Matic dropped into the back line, helping Phil Jones cover Glenn Murray, should possession break down in the first phase of their build. Despite frequently splitting Brighton’s midfield line, the hosts could only really penetrate from moving the ball into Young on the right. But United lacked height against Brighton’s aerially strong back line, and struggled to break into the penalty area with real quality. 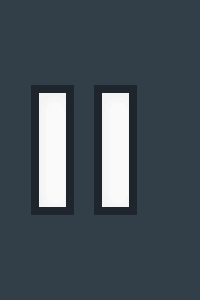 One moment changed this, however, as Paul Pogba – to this point mainly drifting to the left of the build – briefly moved to the right and drew a foul in the box after Matic’s accurate switch. The Frenchman stepped up and, after another arduous ‘run-up’, slotted home to give United the lead. 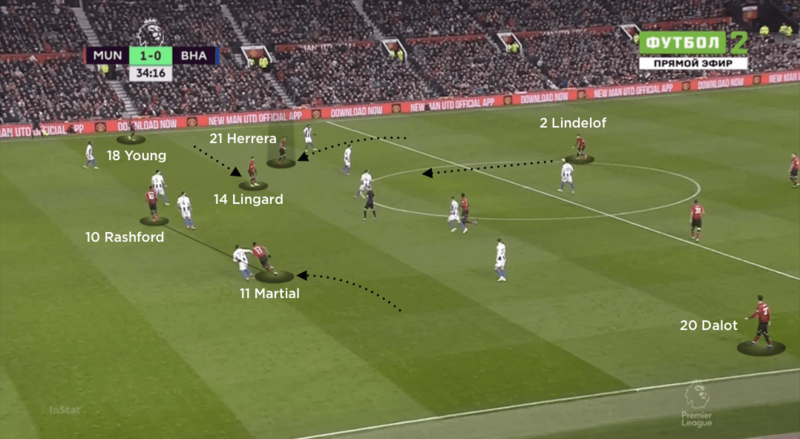 The increasingly narrow positioning of Lingard and Martial condensed the visitors’ midfield block and allowed for first-time sets into the advancing fullbacks. 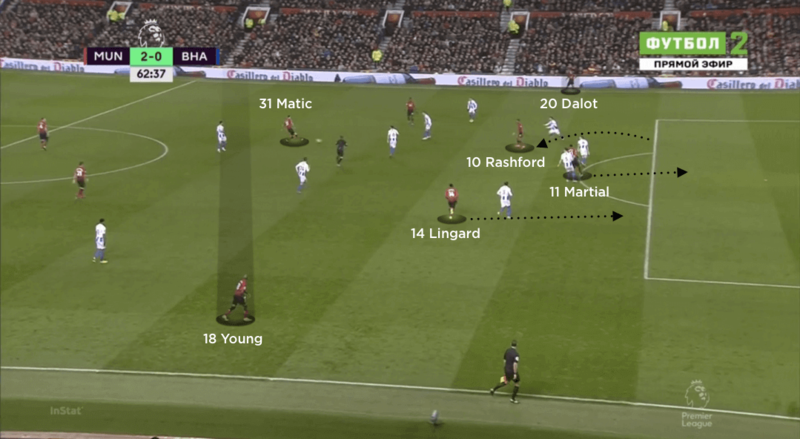 With Rashford also starting to drop towards the ball and Brighton blocking access into the United front three, Dalot in particular had more space to receive and drive forward on the left flank. These movements came into play just before half-time, as Dalot found Rashford just inside the area, where the England forward found space to finish superbly from a tight angle. In the second half, United dropped into a deeper block in reaction to Brighton looking for Murray more quickly than they had in the first. As the visitors came on to them, this gave United more space to attack on the counter, with Martial and Rashford in particular able to drive forward with the ball. They generally reduced their movements in behind, however, which slowed down their attacks and gave Brighton more time to reset after losing possession. 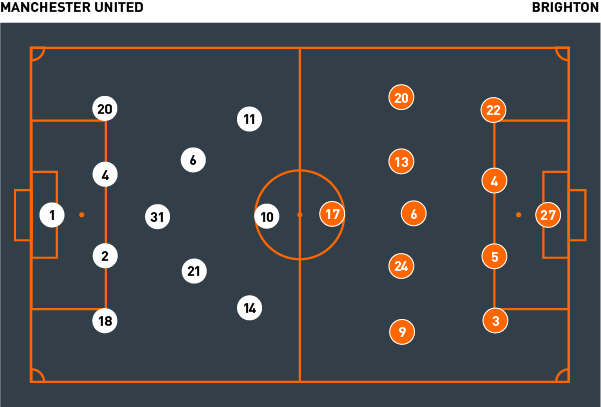 Without the ball, United used a 4-2-3-1 mid-block strategy, focusing on a tight man-marking system within their defensive units. Both full-backs followed their men all the way back to the ball, even if this meant leaving their back line. The hosts excelled during the defensive transition within Brighton’s half, as their close proximity to one another in possession enabled their counter-pressing intentions. However, they did struggle if they lost possession in their own half, where Brighton targeted their vacant right side. With Lingard moving central and Young often ahead of the ball, the Seagulls had the perfect space to secure the ball after a regain and progress into the final third. Left-back Gaetan Bong in particular stepped forward, with Jurgen Locadia running inside to drag Young away from the space. That said, United’s back line was solid from most subsequent crosses and set-piece deliveries, even against Brighton’s powerful defenders. The hosts reverted into a deeper block in the second half, giving extra protection against any second balls around Murray. Despite the visitors grabbing a goal back through Pascal Gross, United saw out the game to give Solskjaer a sixth Premier League win from six. 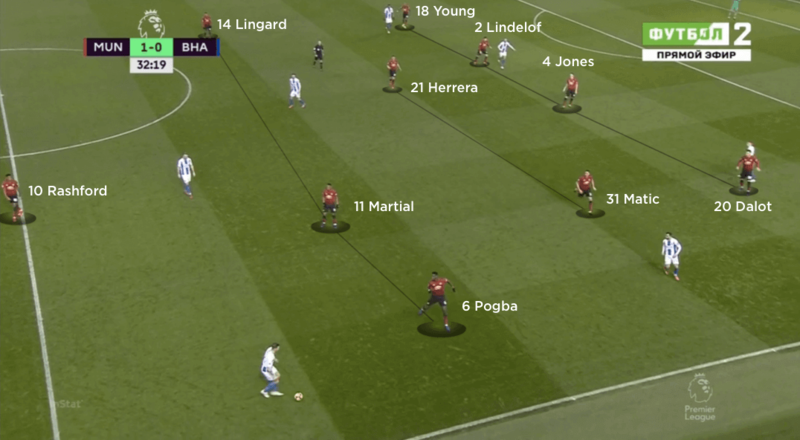 When Manchester United had possession, the narrow movements of Anthony Martial and Jesse Lingard enabled central penetrations through or over Brighton’s block. Ander Herrera stepped behind Brighton’s midfield to give his centre-backs the option to step forward. The hosts utilised a 4-2-3-1 structure in defence, and prioritised an aggressive man-marking strategy, often following players well away from their original positions. Marcus Rashford dropped much deeper to link play in the second half, with Martial and Lingard making penetrative runs in behind. Both United full-backs continued to move high, providing attacking width for the hosts. Brighton set up in a 4-5-1 formation, but played mostly in transitions and looked to the enhanced spaces on their left as soon as they regained possession. Both Gaetan Bong and Jurgen Locadia exploited Ashley Young’s high positioning. The visitors used a 4-5-1 defensive block, alternating between a mid and low-block through the game. They progressively narrowed to stop central penetrations, which then opened up wide areas for United. Locadia and Pascal Gross both moved into a central supporting role in the second half, while substitute Anthony Knockaert and Bong provided the width as Brighton searched for a way back into the game. Brighton head coach Chris Hughton set his team up in a 4-5-1 formation that was happy to allow their opponents possession. 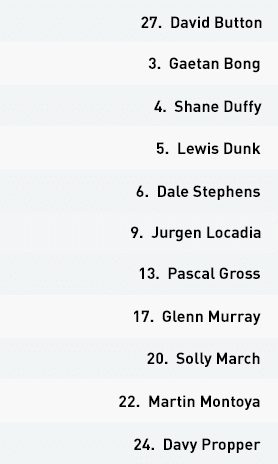 During moments of transition, they consistently looked for lone forward Glenn Murray, as he drifted away from the Manchester United centre-backs. 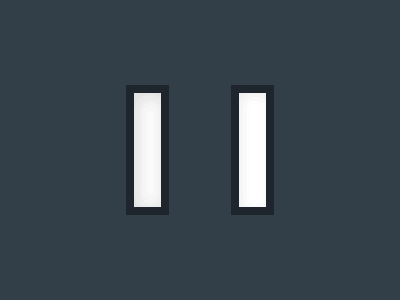 Whenever the visitors regained possession, they looked to move the ball quickly to their left side. If Murray remained central, left-back Gaetan Bong would step forward into an area vacated by Jesse Lingard’s inside movements. Direct runs inside from Jurgen Locadia dragged Ashley Young inside too, allowing Bong to continue his progress. During longer spells of possession, the visitors’ back line spread incredibly wide to guard against any intense United press. Murray continued to move out to the left, with direct balls into him a secure method of progress. Despite the hosts using a man-marking strategy, nether centre-back would follow him so far away from the central lane – and with Young continuing to man-mark Locadia, Murray had space to receive and look for both Locadia and Gross inside him. 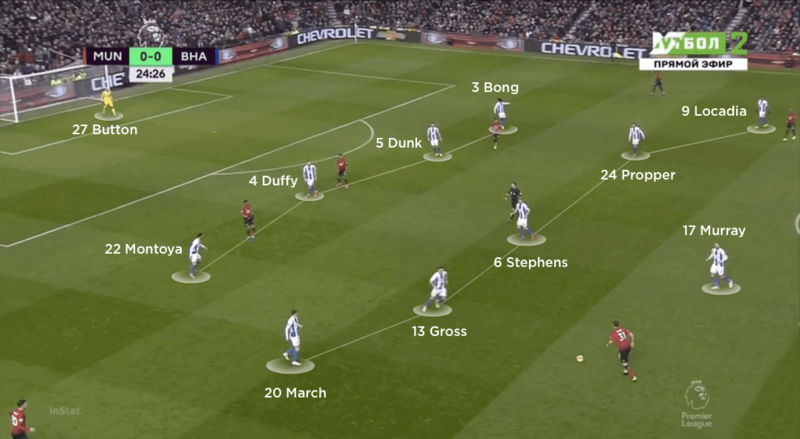 Play on Brighton’s right wasn’t as effective, with their one central striker drifting left and Diogo Dalot staying deeper – and recovering quicker – than Young on the opposite flank. In the second half, perhaps in response to going two down, Brighton looked to work the ball into Murray as quickly as possible. The experienced striker won a number of aerial duels and free-kicks, but was replaced by Florin Andone on the hour mark, after which the visitors’ direct approach receded. The introduction of Anthony Knockaert on the right gave them more attacking width, with Locadia now drifting inside as a more consistent second striker alongside Andone and Bong continuing to plough forward on the left. With a more consistent attacking presence, Brighton did pull a goal back through Gross, but they were unable to find an equaliser in the 20 minutes that remained. The visitors used the same 4-5-1 structure without the ball, but with Locadia often tracking Young’s runs all the way, they sometimes looked like a back five. Their central midfield unit was frequently split with vertical passes in the early stages; to combat this, their entire defensive structure narrowed and collapsed on itself – especially if the ball found its way into the feet of Lingard, Rashford or Pogba.  This made central combinations tougher for United, forcing them to attack the wide areas. While this initially played into the hands of an aerially powerful defence, it also cost Brighton a goal. The one time Pogba moved wide right to face Bong, he coaxed a foul from the left-back that won his team a penalty he duly converted. United’s second, meanwhile, came as a result of the visitors’ failure to properly track the dangerously mobile Rashford. As Brighton pushed for a way back into the game in the second half, initially getting more men around Murray and then committing more numbers forward in general, they inevitably left themselves more susceptible to quick counter-attacks. But they defended well the few times United looked genuinely dangerous, eventually going down by only the single goal.